The many antique and vintage samplers that can be found on the internet fascinate me. I view and collect those I like on Pinterest, which is a great source of inspiration! It is hard to have a favourite as there is such variety out there, but I am always amazed at the time and skill these young girls painstakingly put into their samplers. Surely machine embroidery can be used to create similar master pieces to hang in our homes or to give as presents. I am not sure what those girls would think about our lovely embroidery machines. Do they teach us character building in quite the same way? I wonder! I think that it is the individuals personality that intrigues me most about these samplers. 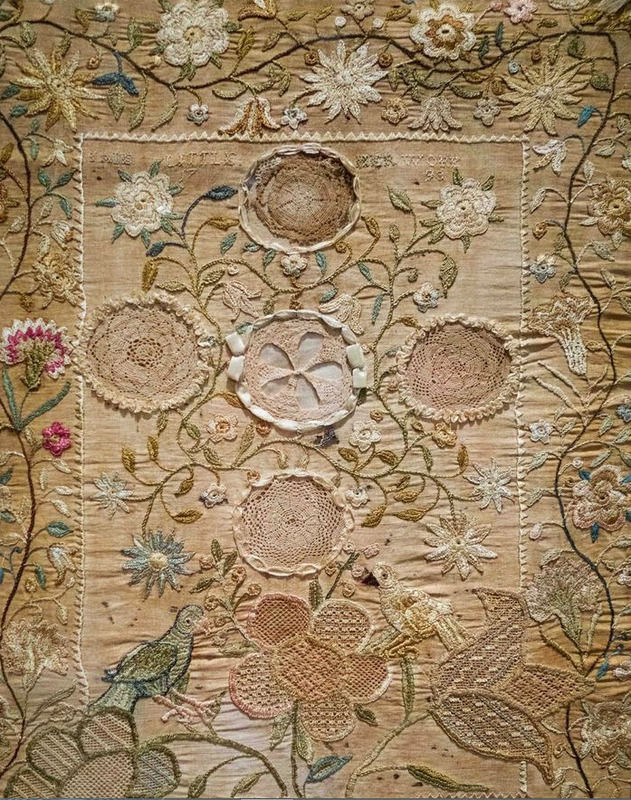 In the same way we can create works of art, with our machines using favourite designs as well as the in built stitches on our machines, finishing them off with some precious notions (buttons, charms, crystals, lace) that we cannot bear to part with. What is the point of keeping them hidden away in drawers? Bring them out, lay them on that gorgeous fabric you have been keeping for that special project, and find the perfect designs for a sampler that you will be very proud of. Last year I was very privileged to be able to teach my very first class at the American Embroidery Conference in Florida. 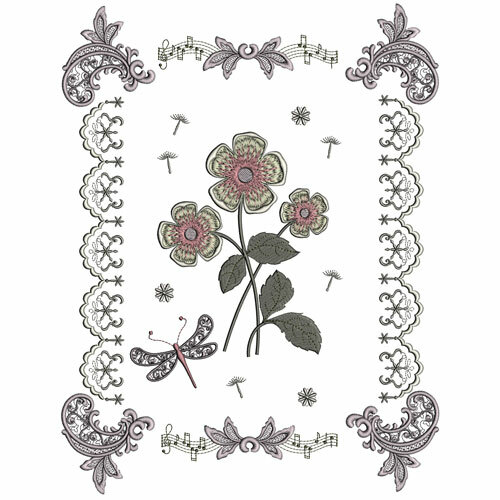 I designed a Graceful sampler with various designs from several of my collections. 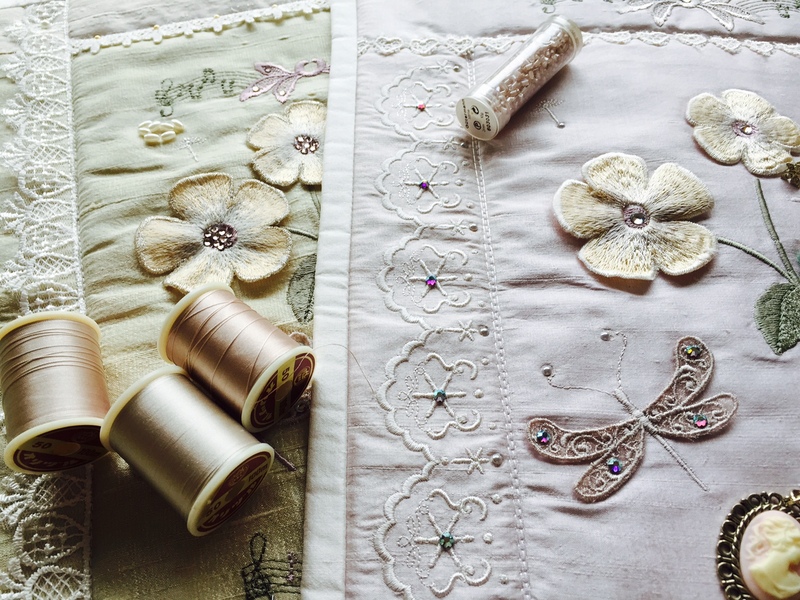 As I am so passionate about silk it had to be embroidered on silk dupion and as well as teaching how to work with silk I wanted to share some other skills like easy positioning, embellishing and three dimensional work. I suspect that this will not be the only sampler I create and I am eager to create another one with more challenges and skills to learn. In the meantime as many of my customers were not able to attend this wonderful conference and I have been asked to make the class available to everybody, I decided now was the time to adapt the class for my next tutorial at Graceful Embroidery so you can all “attend”. I have also enlarged and improved the treasury of designs for the sampler. You do not have to use them all! Choose your favourite or maybe use some of the existing designs that you own. If you are considering creating a sampler but do not know where to begin then this is the tutorial for you. Building on the skills you learn with this simple sampler you will learn positioning your designs with my Outline alignment stitches so that you can then move on to more challenging work for your second sampler. 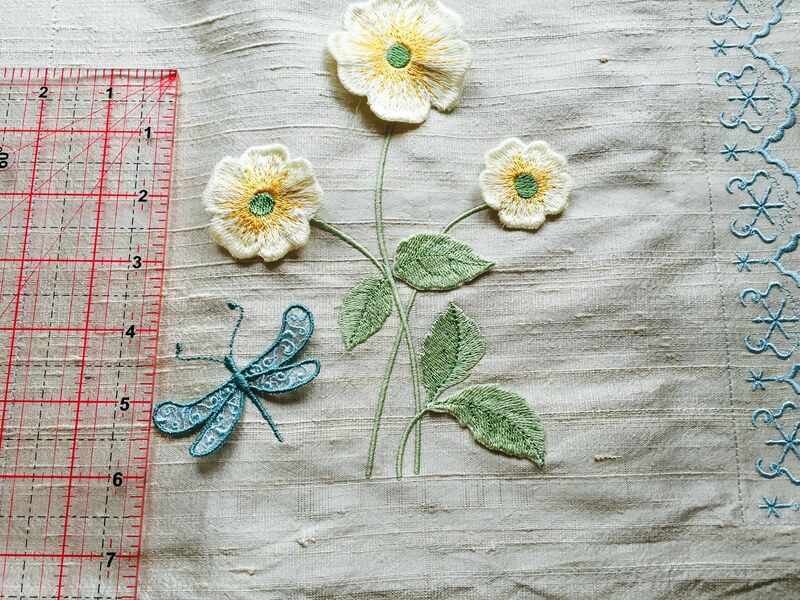 I suggest you begin with the centre piece and add borders which reflect more of the traditional use of embroidery that is found in those vintage samplers. This entry was posted in Discussing machine embroidery, Tutorials and tagged 3 Dimensional embroidery, Embellishment, embroidery machines, Outline alignment stitches, samplers, The importance of colour, tutorials. Bookmark the permalink. I’ve always admired the “Samplers” but never found the right designs or the courage to begin. Hopefully, with your kindness in writing these tutorials, I will learn how and brave the challenge.